Even if you’ve spent a lot of time in front of a classroom or practicing skills in college courses, it’s difficult to overcome the anxiety you feel for student teaching. It’s exciting to finally get the chance to work with students, but there are a lot of fears that people experience, too. 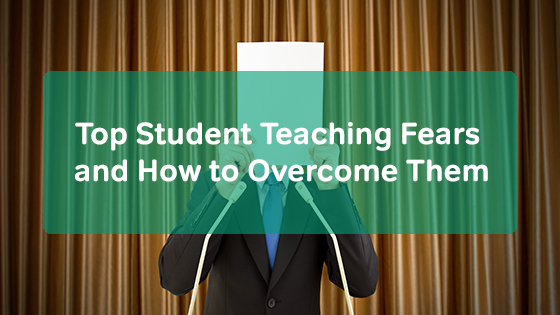 Here are some of the top student teaching fears and some tips to help you overcome them. I taught high school for my student teaching experience. Before showing up for my first day, I had visions of disrespect, disruptions, and more. I joke that I look like I could be a high school student, so I worried that the students wouldn’t take me seriously. The main reason that people worry about classroom management issues is that they lack experience handling a wide range of behavioral issues. It takes time to figure out the best way to handle different kinds of situations, and there are going to be days when you just don’t know what to do about a particular student. However, there are some things that you can do to prevent problems, such as lay down the rules, be consistent, and learn names early on in the student teaching experience. When problems do arise, address them right away. Talk to the student one-on-one about their behavior, and use punishments when necessary. If you don’t know what punishments to use, talk to your mentor teacher for ideas. Student teaching comes with a lot of responsibility, and it can seem overwhelming at times. You have meetings to attend, papers to grade, parents to talk to, and lessons to plan. Seasoned teachers have these same issues to deal with, but they find tricks to lighten their load. For example, have students grade some of their own assignments, use the Internet for lesson ideas, and don’t worry about saying “no” to opportunities when you really don’t have the time. But what should you do if your lesson doesn’t go as planned? What if you make a mistake? The answer is simple: forget about the what-if. It’s going to happen. And when it does, don’t sweat it. Use it as a learning experience instead. Student teaching prepares you to handle your own classroom. Teachers make mistakes and lesson plans don’t work out, but teachers learn from these problems. That’s why flexibility, creativity, and a good sense of humor is so vital to a teaching career. When you’re only with students for a short period of time, it’s difficult to discover their strengths and weaknesses. This information is important if you want to plan lessons that really engage and stretch your students. Luckily, you have a mentor teacher who knows the students and can help you come up with ideas to help them. As far as meeting all of the students’ needs, consider using a variety of materials, including reading material at different levels. Allow the students to set their own pace, or carefully choose groups or partners for activities. When writing lesson plans, look for lots of hands-on activities or ones that require active participation. For elementary-aged students, use parent volunteers to help you provide more one-on-one time with each student. For a student teacher, parents seem intimidating. You don’t want a parent to yell at you or get mad about something that you did. However, you’ll find that partnering with parents is a great way to gain their respect and support. When you have parents working with you to help their child, everybody wins. In order to communicate with parents, don’t be afraid to make phone calls, send notes home with students, or write emails. If student teaching is standing between you and graduating from college and becoming a teacher, it’s easy to see why you might fear failing it. With so much to do and worry about, you shouldn’t have the fear of failing weighing on your mind. More likely than not, you’ll go home feeling like a failure at one time or another. Don’t let that ruin your experience. Just do your best! Try to get the most from the experience that you can. Look to your mentor teachers as mentors, and soak up as much information from them as possible. Even if you end up failing, you’ll be able to look back on the experience as a great opportunity for learning and growth. Student teaching isn’t easy. You’re going to have rough days, and you’re going to experience things that you weren’t prepared for. Rather than letting your fear and anxiety take over, remember that you’ve spent your college experience preparing for student teaching, and now you get to put everything that you’ve learned into action. It’s exciting! Teaching is what you love; this is why you pursued this profession in the first place. Enjoy the experience and learn as much as you can!